Kermit Baker, senior research fellow at the Joint Center for Housing Studies at Harvard, presented emerging trends in the market at the 30th annual Remodeling Leadership Conference. Baker described 2015 as a year in which "spending exceeds its pre-recessionary high." The remodeling market has almost fully recovered from the economic downturn, he said. ASID was prominently featured in a special section of the Wall Street Journal on Friday, May 8. The piece reviewed the expanded education sessions that ASID will present at ICFF, May 16-19 at the Javits Center in New York; the Society's rich history and future areas of focus; and its milestone 40th anniversary in 2015. Read the section. Don't miss the expanded ASID Education Series at ICFF at the Javits Center in New York, May 16-19. The Society will bring together thought leaders and industry experts to present insightful content throughout ICFF, including sessions on business practices, the impact of design on health and wellness, housing trends, materials, and more. Register today. 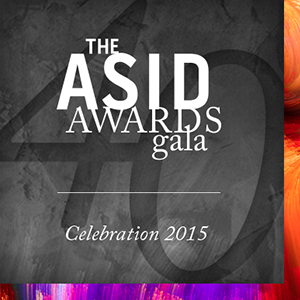 Join ASID as we honor the individuals and organizations that are transforming lives through design and celebrate the Society's 40th anniversary. This year's gala will take place on Saturday, July 18, at one of the largest art museums in the U.S., the Museum of Fine Arts, Boston. See art come to life and enjoy drinks and appetizers during the opening red carpet reception. Then move into the museum’s main courtyard for an elegant dinner and awards show. And finally, round off the night with dessert, dancing, and a tour of the art galleries. Ticket price increases after May 30. The ASID Interior Design Billings Index (IDBI) for the 1st quarter of 2015 confirms that business conditions at design industry firms have picked up momentum. The March ASID IDBI value of 57.7 (50 and above denotes growth) increased from a 4th quarter 2014 score of 52.3, and the March New Project Inquiry rate of 58.8 continues to demonstrate a positive trend. On Tuesday, May 12, Randy Fiser, ASID CEO, David Krantz, ASID vice president of Research and Knowledge Management, and Jack Kleinhenz, Ph.D., ASID economist, participated in a webinar to discuss and analyze the IDBI 1st quarter 2015 report and to examine what the findings mean for the interior design industry in the foreseeable future. Several members of the trade press were in attendance. The IDBI 2nd Quarter webinar will take place in early August. Don't miss your opportunity to network with top firms and designers in NYC at the upcoming ASID Student Day Program at ICFF on Tuesday, May 19, from 10 a.m. – 2 p.m. Attend a full day of activities specially designed for students and recent grads, including a curated tour of ICFF with professional designers (student member exclusive), a panel presentation on the many interior design career paths, and the popular ASID Career Exchange. Learn more and register. Make Your Voice Heard — Vote Today! Elections for the 2015–16 ASID Board of Directors are now underway, and you have until today to cast your ballot. Voting is easy: Simply visit www.asid.org and log in to your "My Account." From the My Account drop-down menu, click on "Society Elections," and follow the voting instructions. If you would like a paper ballot, please contact Keri Kohler at 202-675-2345. Learn more about the ASID Board of Directors. Remember — voting ends May 15. Client Contracts for Designers 101: Are You Ready For Your Next Client? ASID Government and Public Affairs (GPA) has joined forces with members of the Invest in America Coalition to support passage of the Real Estate Investment and Jobs Act of 2015. This legislation would reform an outdated section of the tax code known as FIRPTA, the Foreign Investment in Real Property Tax Act that has negatively affected the U.S. economy and job creation since the early 1980s. For more information please contact ASID Government and Public Affairs. Learn from these design leaders and then join them for a meet and greet at the Dwell Bookstore on the trade show floor. *All sessions eligible for CEU credit require a ticket purchase to Dwell on Design. Use promo code ASID to save $10 on tickets — register today. CAPTIW© (Comparative Assessment and Performance Tool for Innovative Workplace), funded by the ASID Foundation Transform Grant, is a tool that accurately measures the impact of the physical work environment on the innovation performance of a company. The tool was developed as a collaborative effort among more than 40 industry and academic partners led by Dr. Young Lee to tackle the issues of connecting design to the organizational bottom line. Learn more. Over the past decade, architects and lighting designers have witnessed a number of sustainability measures that have shaken up the lighting industry, helping to drive product development while reducing energy use. These initiatives include the incandescent lamp phase-out, along with the promotion of state adoption of updated building energy codes. These are some of the points Illuminating Engineering Society (IES) director of public policy Robert Horner and International Association of Lighting Designers (IALD) public policy consultant John Martin made during a presentation at the American Society of Interior Designers (ASID) legislative symposium. The National Association of the Remodeling Industry (NARI) released its first-quarter 2015 Remodeling Business Pulse (RBP) data of current and future remodeling business conditions. NARI remodelers are finding a good environment for their services. The combination of homeowner desire for improvements in their homes and a more stable economy is enhancing business conditions. The Cooper Hewitt, Smithsonian Design Museum has announced the 11 winners of the 2015 National Design Awards, which recognize excellence and innovation across a variety of disciplines. Among those honored are Michael Graves, for Lifetime Achievement; Jack Lenor Larsen, for Director's Award; and MOS Architects, for Architecture Design. The disastrous results of the global economic meltdown cannot be exaggerated, but it is too easy to view the state of affairs in which design now finds itself in a wholly negative light. In fact, the past several years have been a period of productive innovation for manufacturers, developers, and designers willing to extend their reach into unfamiliar territories. Designers and educators know that an interior design degree program is only the first step toward becoming a design professional. We continue to learn through practice, from our colleagues, and by ongoing professional development activities. Professional associations play an important role in filling the need for more extensive design business education. Through continuing education courses, conferences, workshops, panel discussions, and publications, professional associations keep members updated on the latest industry trends, developments, and practices, including business models, marketing strategies, and management and HR issues. SYSTEM4 - 10 Colors no-limit Designs! The SYSTEM4® modular interior furniture is a Designer’s Dream come true! Design Options without limits and 10 Colors to choose from. Drawers, Double Drawers, Doors, Hatches and Magazine Display Shelves can be placed wherever you see fit, and at any time you may reconfigure, enhance or change your SYSTEM4® Solution without need of special tools. John Maxwell, author of Good Leaders Ask Great Questions, states, "If you want to make discoveries, if you want to disrupt the status quo, if you want to make progress and find new ways of thinking and doing, you need to ask questions." Why not challenge yourself to spend more time developing and asking great questions rather than trying to lead by giving orders and pulling people along behind you? If done correctly, Instagram can bring you loyal fans, all sorts of great compliments, and best of all, clients! This is not 101-level "How to post a photo" advice — you can dig into these tips and immediately improve the way you Insta-For-Biz. Who Is Your Perfect Interior Design Client? Imagining your perfect client is tougher than you think. You want to make sure this client has all the qualities you seek in any great working relationship. They would trust your judgment. They would make decisions quickly and effectively. They would have great communication skills. Let's talk about some commonalities in your perfect client and how getting to know them will help you meet more. Even during the lean years, kitchen and bath remodels topped the list of most-requested home renovation projects for those who could afford them. Now that homeowners are able, willing, and eager to invest more in their homes, demand for kitchen and bath remodels is increasing. Several new surveys show that business has been growing over the past year, and remodelers expect this year to be even better. The words, "There was this hotel I really liked…" have turned up more and more frequently when discussing design aesthetic with a client. People travel and explore for retreat and inspiration, and often when they return, homeowners realize they can have a similar escape at home. A relaxed lifestyle is something people want more and more, and their homes are reflecting that. The old rules of formal living, and therefore decorating, are disappearing. People are looking to enjoy themselves more and impress less. Here's advice from interior designers on achieving that perfect middle ground — gorgeous, relaxed style. A note of caution for DIYers thinking about giving their house a bit of a change — it can go horribly wrong. Whether it is an entirely white bathroom, a decision to match the carpet with the drapes and the sofa, or an obsession with frilly accessories, there are thousands of homes that should have stayed as they were. Concurrent with progress in building sustainability have been significant advances in operational sustainability efforts. Helped by the cost savings resulting from reduced energy consumption and water conservation, adoption of green practices by hotels far outpaces LEED certification in hospitality. In July 2014, a study from Cornell University revealed that in addition to the benefits of improved operating efficiency, hotels gain a revenue benefit when certified through the LEED sustainable building program. The Environmental Protection Agency estimates new formaldehyde standards would cost the furniture industry tens of millions of dollars annually to cover the expense of testing and restrictions. Furniture industry executives expect the proposed regulations would cost 7,000 American manufacturing facilities more than $200 million each year. That's why big box furniture retailers like Ikea, smaller furniture businesses, and even the Chinese government are fighting the bill, trying to get the EPA to back down and loosen their proposed regulations. The U.S. Energy Information Administration (EIA) released a new "Today in Energy" brief with some slightly good news for energy conservation. The report stated that energy demand has decelerated in the residential and transportation sectors, and total U.S. energy consumption is not expected to return to growth levels seen in the latter half of the 20th century. At the outset of any research building project, the design team must work with the stakeholders to reconcile a multitude of priorities and competing goals before proceeding with design. It is important that expectations for materials and MEP systems performance be established early in the design and construction process. It is equally important that all stakeholders understand and accept these expectations, both during design and construction, and as the finished building is occupied and used. Smart technology is providing a boost to the retail sector by helping shoppers navigate through stores. This wayfinding trend is part of the "Internet of Everything" (IOE) approach, which will eventually see digital connectivity at the center of everyone's daily lives. The nature of work is evolving, and so is workplace. The workplace of the 21st century must meet the need for flexibility and choice. The ways we come together to collaborate and interact, as well as the ways we seek concentration and solitude, are more relevant now than ever. Anna Hubbard, spa business manager at The Good Spa Guide, knows the importance of design in attracting consumers in the first instance, and in creating a unique and memorable experience. "The spa market is competitive and ever evolving," says Hubbard. "The interior design is key to what makes the spa unique, memorable, and somewhere guests do not want to leave." She shares her thoughts on the three most important components of a successful spa design.